Record Skype: Yep, this is the fastest way to record a Skype call on Mac. Inter-application audio: Aside from hooking up your favorite audio recorder to TextEdit’s voice-to-speech so you can pull off the now-cliched “robotic Mac voice”, a la Radiohead, you could actually use this for useful stuff, like routing sound between apps that don’t support ReWire. Of course, this should sound familiar to anyone who knows the superb Linux-bred utility JACK, which offers this and much more. It’s worth checking out both; JACK has by far the deeper feature set, but if you need only quick-and-dirty routing, Soundflower could be the way to go. 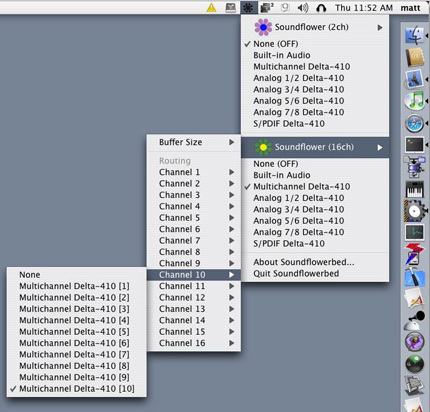 Truly die-hard Mac inter-app audio lovers might even use both, especially since they’re both free and now both run on Intel Macs. Thanks to Nick Inhofe for this, a guy who’s cool enough to have interned at Skywalker and earned an IMDB page!